Photographer Jonathan Nimerfroh captured evidence of just how brutal the winter in Massachusetts has been. 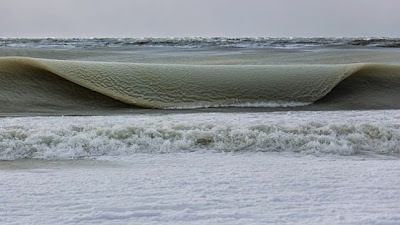 Waves off the coast of the island of Nantucket southeast of Boston had begun to freeze. He describes, "They were perfect dreamy slush waves. What an experience to be absolutely freezing on the beach watching these roll in while I mind-surfed them..."